You can make a monetary donation to the museum online, by mail, or by telephone. To make a donation online, click here! You’ll be directed to our online store, where you can make a secure payment with Visa, MasterCard or Paypal. Donate this holiday season and make your gift go even further. From November 27 through December 31, PayPal Giving Fund will add 1% to all donations made through paypal.com/fundraiser/charity/4514. Simply call the museum office at 216-623-1111 and speak with our Executive Director, Heather Alexander. Donations can be made via telephone with Visa and MasterCard. IWASM gladly accepts memorabilia donations that document women's history in air & space. To donate contact our Collections Manager, Mike Sharaba, at msharaba@iwasm.org or 216-623-1111. Shop online with AmazonSmile, choose IWASM as your charity of choice, and the museum will receive .5 percent of your total purchase. Click here to begin your shopping and support of the museum. IWASM accepts biographies of women in the fields of air & space. 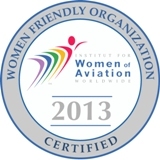 If you are a woman who is currently a pilot (private, commercial, or instructor) or in a field related to air & space (i.e. mechanic, engineer, aeronautics, etc) we would greatly appreciate your biography for our archives. Our archives have been utilized by researchers and students interested in the contributions woman have made to air & space. We also accept biographies from family members looking to tell the story of their loved ones who have contributed to air & space. Click here to complete a biography form online or to download and mail in a biography form click here. We look forward to learning about your story! Office supplies, printer paper, etc. These items can easily be viewed at our Amazon Wish List site here. Want to find out more about women in air & space? Click here for a list of links to help you in your quest for more information!